Protesters in France, Germany and UK are saying they want trump. They are getting tired of idiots like jcc and his Marxist buddies. And your comments jcc are because you are a wired for lies, being a demonrat no truth will ever enter your head. What I said is true, it has always been "we are on your side" when behind the doors they are and where turning the screws into the working man. Your too blinded and too uneducated to see it. What's really different and has never been seen before is that both left and right are united on this protest. 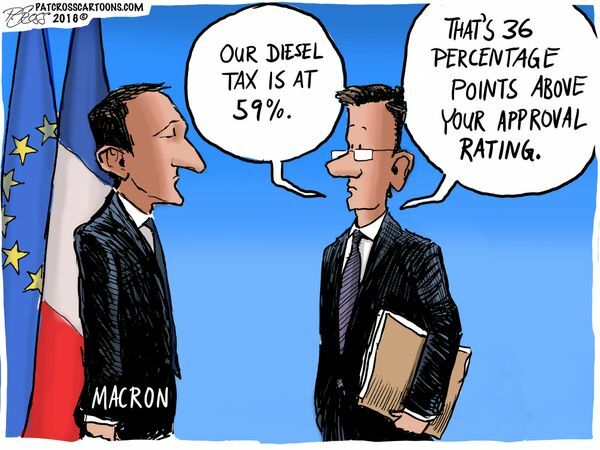 It's the normal middle class who are really pizzed at the socialist macron for making their lives more difficult. I guess you were not paying attention when the Tea Party first started, and Fox for weeks disparaged it? Note it did not start out as exclusively the right wing movement that it evolved into. Its fixed try to understand, you need the demonrat mind rewired so truth is not seen as a lie. Now you profess to know my needs? Maybe I should include "delusional" to the mix. Now the protests are going to get bigger.. the unions have said they will join the regular people...ya, this had no union involvement yet! Hope this lefty gets taken down soon.. it will be another nail in the worlds far left coffin. Sounds like they all were like the millennials in the US that think they want communism just wait till they get a real taste of it, like the ones in France did. MSM did not want to show all that for weeks, they don't want anyone to hate the climate religion. This should be a huge lesson for all the millennial communist supporters and the ones that are in love with the Marxist religion of climate change. Wake up to all little voting children, learn by France what the demonrats wish to do. Yeah pay for your college ha ha ha you will end up paying for it one way or the other. Maybe by newly mandated demonrat slavery, who knows for sure right? The demonrats have never been nor will they ever be for the working man or the average pee on, its just more of their crap lies. Somewhere on the web there is a long historical list of the things the Democrat Party has backed and not many of them were ever for the good of us peons so get a life and hunt it up! For starters go through the bullets political memes... If it doesn't turn up there, then go through what memes are here, YOU WILL FIND IT!! Sorry, but almost anybody on this site using the word "never" is plain stupid or a liar when offering no proof. And never is really hard to prove or easy to disprove. In this case, the author lies repeatedly, he apparently has no understanding of the difference of stating an opinion vs just slamming an entire group, without proof, to further his narrative. So I hold him accountable, nearly every time. BTW I've been a registered Republican my entire life, I don't support those that give Republicans a bad name by making stupid comments. Last few years many of my fellow "republicans" have been leader of the pack in that regard. Never is true in that usage, its the way the demoncrap is. OH MY GOD!! Now we're gonna burn up , like really soon,, the sea will rise so fast now... hard too believe he is giving up on the world just because hundreds of thousands are angry. And the protesters are not giving up,, theyvwant him out,, wow! They want a savior of the world out???? Over the same climate tax shyt. Here in Canada we are pushing back too,, several provinces have told our village idiot to shove his climate tax up his azz....conservatism is sweeping across the country. I hear Switzerland just elected a right leaning conservative! I just wish everyone would wake up to the climate engineering. When finally everyone is woke up the climate lies will hold no weight at all. Climate crap is the biggest lie and farce ever perpetuated on this world.